Our mission is to beautify and protect the environment through civic planting projects, and educational and horticultural programs, in Puerto Vallarta, for the enjoyment of our residents and visitors. Our vision is to enhance the natural beauty of Puerto Vallarta for the benefit of the community at large and to stimulate business and tourism. In 2010, a number of Puerto Vallarta residents banded together to beautify their city. Concerned by the impact of recent negative media hype on the tourism industry and the lack of landscaping by the municipality, they chose to plant the seeds of change through gardening city parks and green spaces. The mission of the club is to beautify and protect the environment through civic planting projects and educational and horticultural programs for the enjoyment of Puerto Vallarta residents and our visitors. The firm belief is that gardens are a powerful tourism generator that can drive new tourist traffic to an area. The club's first project was a makeover of the grounds at the Los Mangos Library. Trees were pruned, bougainvilleas were planted and the entrance path was lined with Spathiphyllum (Peace Lilies). Sidewalk planters became the next target for activity and the planters are being filled with flowering trees and bougainvilleas. Many of these can be seen along Calle Basilio Badillo and in the Mercado Area. Check them out yourself to see how these planters are already flourishing and then just imagine how they will look after their first rainy season. The PV Garden Club is still actively seeking sponsors for these planters. Many families and local businesses have already helped and are pleased with elegant 30×30 cm (12x12 inch) hand painted tiles that adorn the planters in tribute of their sponsorship. The next dream of the PV Garden Club is to launch an annual "Puerto Vallarta Bougainvillea Festival" that will make our city known as "The City of Bougainvilleas." Bougainvilleas thrive in Puerto Vallarta, resist pests, establish themselves quickly, bloom almost continuously, and represent a positive image of Mexico. This makes them a perfect selection for showcasing in a floral festival, the likes of which have been a success for scores of other tourist destination cities throughout the world. Many of these festivals, such as the Cherry Blossom Festival in Washington, D.C. are proven economic stimulators that bring in millions of dollars a year to their hosts. It is certainly time for Puerto Vallarta to adopt this model and bring new tourists to our city. For information on membership or to sponsor a planter, please contact Bonnie Mott. So pull up your sleeves, dig in, and contribute to a better, greener and more economically sound Puerto Vallarta. A Puerto Vallarta Renaissance in underway! The PV Garden Club is a local beautification group dedicated to better parks and gardens in public spaces here in Puerto Vallarta. Our group is made up of volunteers who believe that the beauty of nature enriches all of our lives and the well-being of all of our citizens. Everyone is invited to get involved! Please join the PV Garden by becoming a member or by sponsoring a planter box here on Basilio Badillo Street or in the Mercado area by the Rio Cuale. Our group receives no public funding and relies solely on the generosity of folks who believe as we do: That the people of all great cities know the value of beautification to stimulate tourism and commerce and create a nicer place to live. For more information on becoming a member of the PV Garden Club, or to sponsor a planter box, please email Bonnie Mott. Open to all, not just Garden Club members, our summer socials are a great opportunity to meet new people, find out what the PVGC is all about, and reconnect with friends in a relaxed, fun setting. Open to all, not just Garden Club members. This is a great opportunity to meet new people, find out what the Garden Club is about and reconnect with friends in a relaxed, fun setting. This season was our biggest ever and we wanted to say thanks for helping us exceed our goals. We couldn't have done it without you. As summer approaches, we would like to take advantage of this quiet period and plant a large number of palms. These plants are expensive and any donation you can make would be greatly appreciated. We'll be getting together at the Palm Cabaret and Bar on Wednesday, March 29 at 9:30 pm "You Bette We Did!" performance by The Chicago Cabaret Project featuring the music of Bette Midler. At this month's meeting, Mike Laking, Photo Artisan and Garden Club member, will give a presentation on "Nature Photos Made Easy". These tips and techniques should be helpful for our many members that love taking photos of plants, gardens and flowers. Please join us at the new Incanto Vallarta Cabaret & Piano Bar on Thursday, February 23 at 5:00 pm for a reception with complimentary appetizers on the main floor terrace overlooking the Rio Cuale. Sample the bountiful variety of the many locally grown exotic fruits and vegetables. Discover new sources of fresh food and learn about those. Our premier gala fundraiser for the Vallarta Garden Club, Fiesta Rosa, will be held on Tuesday, January 24, 2017, in honor of the non-profit organization’s ongoing effort to beautify the city. A lot is going on around Banderas Bay this week including Live Shows and Concerts, Ceviche & Aguachile Market, Fundraisers, Art Walks, Cooking Classes, Adult Bingo, Farmers Markets every day of the week, and so much more. At the kickoff event at the Jazz Foundation, we will: Highlight work accomplished this summer; and Share information on this season’s upcoming activities and events. We certainly have been busy in PV. Using your generous donations, we've constructed more than 200 new planter boxes -- the largest number of boxes ever built in a single year. And it has proven to be quite the project. Greetings from lovely Puerto Vallarta. Summer has arrived and what may be for you the “low season” is, for us, the PV Garden Club AC, the “high season” with an enormous work volume ahead of us before the beginning of the rainy season. Only 60 guests can enjoy this exclusive, candlelight dinner at Villa Bahia, so book your tickets early for this magical, ocean-front evening on Puerto Vallarta's beautiful South shore. The venue will be Oscar's Restaurant for our "Fiesta Blanca" ("White Party") on Tuesday, January 19, 2016 at 6:30 pm. In keeping with the theme, please dress in white attire. We begin a new season and welcome back our supporters and members who are returning now. This letter is a comprehensive report of the activity of the club through the summer. 2015 is our most ambitious year ever and we can't wait for you to see all of the work we've done when you return to Puerto Vallarta for the high season. It's beautiful. 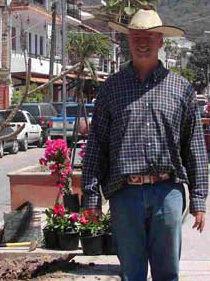 Got Photos of Vallarta Streets Before the PV Garden Club Beautifications? Puerto Vallarta Garden Club - Beautifying Vallarta, is looking for pictures of various streets in Vallarta that pre-date our plantings. This is a cultural and artistic festival with the aim of uniting the community and retaining our local culture, while at the same time creating an awareness in the minds of the audience to preserve the natural beauty of Puerto Vallarta. Three world class gardens, the April 30-May 2 Bugambilia Festival, and the annual election of officers are the subjects of the Vallarta Garden Club meeting on Thursday, April 16 at No Way Jose! in Old Town Vallarta. The guest speaker will be Jane Peabody, a past Vice President of the San Francisco Garden Club. She will be speaking about and demonstrating floral arrangement on March 19 at No Way Jose! PV Garden Club will meet on Thursday, February 19th at 11:00 am at No Way Jose! Restaurant. Troy will be speaking on ways that you can develop an urban garden on your decks. As anyone who attended last year's sold out event at Casa Chickie knows, PV Garden Club hosts the biggest and best party of the season! The best of everything - location, entertainment, food, dancing and wine. Join us on February 26. You likely have noticed the on-going beautification of the pedestrian street leading to Los Muertos Pier. This past Monday, the city of Puerto Vallarta sent a crew there to continue the work. Join us at No Way Jose! for our Puerto Vallarta Garden Club Meeting on Thursday, January 15 at 11:00 am. Our guest speaker will be Leslie Korn, PhD, MPH. A lot is going on around Banderas Bay this week including Kitty Bingo, Mark Alan Smith, Movie Screening, Men's Chorus Winter Concert, Toys for Tots Golf & Dinner Dance, Vallarta Open Tennis, Chili Cook-off & Taste of Nuevo Vallarta, Farmers Markets every day, and so much more. Tuesday Morning, December 2 we will be meeting at the corner of Basilio Badillo and Olas Altas at 9:00 am for our first Garden Club Work Party. We hope to get Basilio Badillo cleaned up and pruned, and if enough show up do Olas Altas also. Our PV Garden Club AC season begins, as you may remember, November 1. The summer has been long and hot. We have used this time to get our trees and bougainvillea, now well established, into perfect shape. Krystal is one of the most knowledgeable people in Vallarta to ask questions about nutritious food – how to shop, what to look for, what to avoid, how to grow it. News from the Puerto Vallarta Garden Club - Beautifying Vallarta! "The Pier Street" of Francisca Rodriguez is a work in progress. We are investigating how much it would cost to finish the street using the same pattern that currently exists in front of Archie's Wok. The Future of PV Garden Club: Why Should You Care? In a town that relies on tourism, the garden club's mission of Beautifying Vallarta makes all other endeavors here more successful. Without a vibrant economy, neither the businesses nor the many other worthwhile charities can thrive. Volunteers are needed to staff the PV Garden Club booth for the Bugambilia Festival May 9 - 11. We will be selling bougainvillea, t-shirts, booklets, and encouraging people to become members or get involved however they can. The "Coffee Table Book" contains 72 pages and over 300 photos of the 2nd Annual Bugambilia Festival Puerto Vallarta Cocktail Kick-off event that was held at Casa Chickie on February 27, 2014 and is now available. The Second Annual Bugambilia Festival is just around the corner! And we hope you’ll be able to participate on May 9 - 11, 2014 in supporting the Vallarta Garden Club in making Puerto Vallarta the Bougainvillea Capital of the World. As the time draws closer to our Bugambilia Festival from May 9 - 11, join the Vallarta Garden Club in a series of volunteer efforts in cleaning up different areas of PV. On April 1 we will be concentrating on Old Town Vallarta. Join us. Bruce Beckler will be helping us determine how and why some plants seem to thrive while others don’t. It should be a lively discussion with opportunity for you to ask your question! Join us at the Paradise Community Center on March 20. A generous donor has offered to match funds received by March 15th, up to 80,000 pesos, as a challenge to all of us who want to support "Vallarta Beautification." Let's work together to beautify Puerto Vallarta. To set the stage for the festival and announce all we have planned in May, a Gala Cocktail Party will be held at the beautiful "Casa Chickie" in Coto San Xoaquin on Thursday, February 27th from 6:00 to 8:30 pm. Vertical Gardens? Have you heard of them? Have you seen any? We're told it's a simple, easy to use system that can be tailored to fit any available space. They're becoming the "in-thing" as we all look to a greener future. Linda will share with us the spiritual connection of the Mayan people with their source of life, Maiz - the Food of the Gods. Join us at Paradise Community Center in Old Town Vallarta on Thursday, December 19. The Club is beginning its fourth full year with the important mission of stimulating the knowledge and love of gardening, and beautifying and protecting our local environment through civic planting projects and educational and horticultural programs. What's Happening in May at No Way Jose! This month, you'll enjoy Restaurant Week, Gay Pride and the Bugambilia Festival... what a fun month to be in Vallarta! If you're not in Vallarta this month, make sure to make your plans next year to be in PV during May. Lazaro Cardenas becomes an Artisan Pavilion starting this coming Friday, May 17, during the Bougainvillea Festival (Festival de Bugambilia). Activities go on through the following Saturday, May 25! Vallarta Garden Club needs your help. Two special Bougainvillea Festival events are scheduled to be included in the Festival with the High Tea at Hacienda San Angel on May 22 and the Downtown Vallarta Walking Tour on the 22nd and 23rd of May. May is one of our most beautiful and event filled months of the year and it is unfortunate that so many people leave for the north early and miss our celebrations. The event is divided into three categories: large pets, medium pets and small pets of which 5 finalists will be drawn from each category. These finalists will compete in front of the judges with all their grace and style to win the awards of 1st or 2nd place in each category. In conjunction with the 2013 Bougainvillea Festival in Puerto Vallarta, you are welcome to join the Catrina Parade and Contest to take place on May 18. All participants in the parade will have traditional face paintings and colourful costume designs. Welcome to PV's Greatest Springtime Celebration on May 17 to 25! The Festival produces and coordinates daily events featuring diverse and creative programming promoting traditional and contemporary arts and culture, natural beauty, and community spirit. Joaquin Aja will be our guest speaker at the April meeting of the Puerto Vallarta Garden Club. Join us at the Paradise Community Center on April 18 for updates on all of our city beautification projects. Join us on March 21 at the Paradise Community Center where our guest speaker, Bruce Beckler, will speak on the topic of pesticide free gardening, the challenge they had to meet when pesticides were banned in Vancouver, B.C. Kick-Off Party for the First Annual Bougainvillea Festival at No Way Jose! Join the Puerto Vallarta Garden Club for the formal announcement and party to officially kick-off the activities in preparation for Vallarta's First Annual Bougainvillea Festival at No Way Jose! on March 6. Puerto Vallarta is poised to be even more successful economically than we were before as a magnet for tourism. We are proud to include as members many native Puerto Vallartans and our goal is to be more than an ex-pat club. Do you have a green thumb and a few hours to spare? The Puerto Vallarta Garden Club is taking over Lazaro Cardenas Plaza on Saturday, June 16, for a full day event, with the mission of landscaping this beautiful but somewhat neglected green space in Old Town Vallarta.